Bharat balancing weight is the largest manufacturer of wheel balance weights in India. 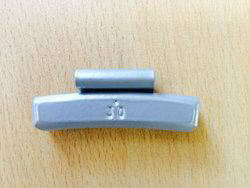 For steel wheel we have clip type weights and for alloy wheels we have both sticker (adhesive) type and clip type weights. We supply steel wheel weights to various oems viz. maruti suzuki, toyota, hindustan motors, fiat and renault nissan. Looking for Steel Wheel Weight ?